Match day 1 in 16 hrs. Note; a competitive league on the .nl server. Send me a msg in OSM or find my profile on .nl server. 4 teams left from 16. Send me a msg in OSM or find the slot in my profile. 5 available teams; 3 days left! Teams: Atalanta, Bologna, Cagliari, Chievo, Empoli, Fiorentina, Frosinone, Lazio, Napoli, Parma, Roman, Spal, Torino, Udinese. Name League: Ignorants are back! 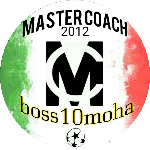 Come join this tough league when a lot of managers. Played it on .com, is as long as MLS and very competitive. Send me a DM on .nl server or find my profile and join the league.